5. The roof is covered with some material which will protect the interior of the building from the action of the elements. This covering may consist of any one or more of the materials which, together with their weights per square foot, are indicated in Table III. The weights here given for materials which must be laid upon sheathing, do not include the weight of the sheathing, which is given separately. A short description, together with necessary information for use in estimates, will now be given. * "Steel Mill Buildings," p 5. Batten sheathing, 4-in. by 1-in. Sheathing. Sheathing is generally laid directly upon the purlins (see Article 6); and upon this are laid the shingles, slate, tin, or tile. Sheathing is usually made of a single thickness of planks, 1 to 2½ inches thick, laid close together. In some cases, however, when batten sheathing is used, it is spaced from 2 to 4 inches apart. This has the advantage of being cheap and at the same time allowing good circulation of air beneath the roof covering, and consequently dampness due to any cause will soon dry out. Batten sheathing is much used where the roof covering consists of slate, shingles, or tile. Slate. Roofing slate is generally of the characteristic slaty color, but may be obtained in nature in greens, purple, reds, and other colors. It is made in thicknesses of from 1/8 to ¼ inch, in widths from 6 to 24 inches, and in lengths from 12 to 44 inches. The 12 by 18 by 3/16 -in. slate is probably the most commonly used. Slate should be laid as shown in Fig. 9, and the pitch of the roof should not be less than ¼ . If the pitch of the roof is less than this, the lap should be made greater than 3 inches, as is shown in Fig. 9. The lap should be increased at least ½ inch for every 1/100 in pitch; and the minimum pitch should never be less than 1/5, since it is practically impossible to prevent roofs with a smaller pitch than this from leaking, especially if a strong wind is blowing. Fig. 9. Method of Laying Slate. The number of different sizes of slate required to lay 100 square feet of surface, and also their weight, are given in the handbooks of the various slate companies. With a 3-inch lap, it takes 160 of the size and thickness mentioned above to lay 100 square feet, and the total weight of this square is 650 pounds. Slate is one of the most durable of roofing materials. Its first cost is high, being from 5 to 8 dollars per hundred square feet; but the cost of maintenance is almost nothing, since it is affected neither by the elements nor by the action of gases or acids. In case the roof would be subjected to the action of gases or acids, it is advisable to use copper slating nails. Skylight Glass. Skylights usually consist of glass about 3/16 to f inch in thickness, supported on light members of iron or galvanized iron which act as a framework. The actual weight of glass of different kinds can be accurately obtained from manufacturers' catalogues, and the student is referred to these; they may be had by addressing the manufacturers (see Figs. 73 and 74). Fig. 10. Tin Laid with Flat Seam. Fig. 11. Tin Laid with Standing Seam. Tin. This is made by coating thin, flat sheets of iron or steel, either with tin alone or with a mixture of tin and lead. In the first case the product is called bright tinplate, and in the second case terne plate. Terne plate must not be used where it will be subjected to the action of acids or corrosive gases, since the lead coating is rapidly destroyed, and then of course the iron also. Tin plates come in various sizes and thicknesses; but usually 112 come in one box. The most commonly used is a sheet 20 by 28 inches, and of sheet iron of No. 27 gauge, which weighs 10 ounces to the square foot. This is marked "IX." If the box were marked "IC," it would indicate that the sheets were of No. 29 gauge metal, which weighs 8 ounces to the square foot. The value of the roofing depends to a great extent upon the amount of tin used in the coating. This will vary from 8 to 50 pounds for a box of the 20 by 28-inch sheets. A tin roof is formed by fixing together a number of these sheets. The sheets may be connected as shown in Fig. 10, or as shown in Fig. 11. In the first case, they are said to be laid with a flat seam, and in the second case they are said to be laid with a standing seam. Tin roofs rot out very readily unless they are kept painted. If a new coat is given them every couple of years, they will last from twenty to thirty years. Fig. 12. Lapping of Corrugated Steel. Tin can be laid on roofs whose pitch is very small, say -1/10. The first cost is about as much as that of slate, but the cost of maintenance is very high. Shingles. Shingle roofs are very seldom used on buildings for manufacturing purposes, for the reason that they take fire quite readily, leak quite easily, and require renewal quite often. Shingles are from 18 to 24 inches long, and usually run from 2 to 8 inches in width, although they can be obtained of a uniform width of from 4 to 6 inches. They arc laid like slate, the lap being made 4 inches or more. They should never be laid on roofs whose pitch is less than 1/3. It takes about from 800 to 1,000 shingles to lay 100 square feet of roof. The cost is about $5.00 per 100 square feet; but under the best conditions, the life of shingles is only about ten years. Corrugated Steel. Corrugated steel is made from flat sheets of standard gauges, and may be either galvanized or left as it comes from the rolls. 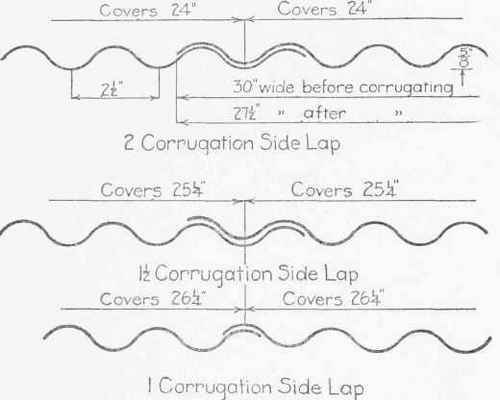 The corrugations are of different sizes and widths; the total width of the plates runs from 24 to 28 inches, and their length from 5 to 10 feet, varying by ½ foot. The sheet most used for roof construction has 2½-inch corrugations; is 26 inches wide after corrugating; and will cover a width of 24 inches with one lap and 21½ inches with two laps. This roofing should be laid with a pitch of not less than ¼, and should have from 6 to 8 inches lap at the ends.